MONDAYS ON MEMORY LANE – BACK STAGE WITH AGNES MOOREHEAD: It is Sunday,February 4th, 1973 and Agnes Moorehead, better known to mortals as Endora, was giving her last performance in the George Bernard Shaw play “Don Juan In Hell” at the old Palace Theatre in Times Square New York. I had to attend the performance since the shocking notice had been in the papers that past Friday that Sunday the 4th would be the final performance after only a total run of 24 performances. 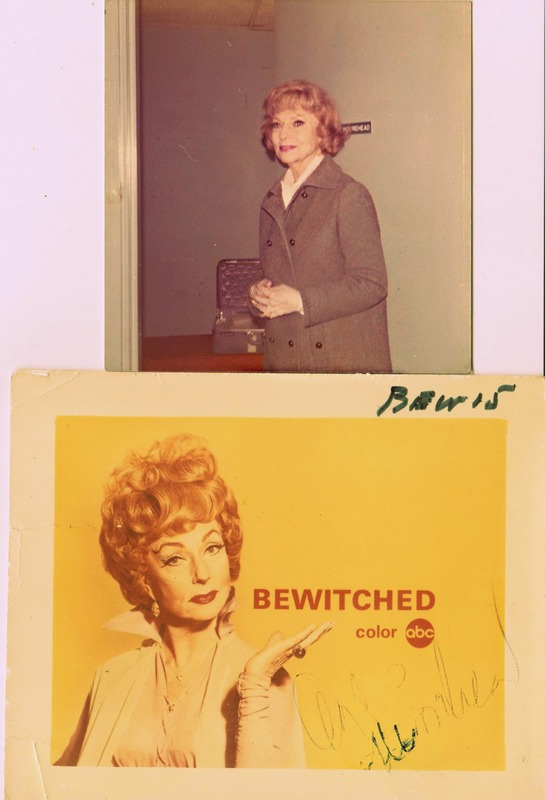 I was still a bell-bottomed sophmore in high school and unfortunately not smart enough to secure the autographs of the entire incredible cast, my main goal was Endora/Agnes! So after the show I ran to the stage door and waited and watched for the luminaries to leave. Paul Henreid left, Edward Mulhare left and Ricardo Montalban left. Ninety minutes went by and the nervous question was – where was Agnes?! The stagehand led me through the winding corridors to one remaining dressing room where the light was still on. “Miss Moorehead…someone here to see you.” There she was, methodically packing her blue suitcase. She came to the open door, “Yes?” as she looked at me inquisitively. “What is it dear boy?” That unmistakable voice, the mannerisms, the posture, the red hair – it was Endora saying ‘speak up!’ I was in awe. I nervously told her had wound my way backstage because I couldn’t run the risk of missing her and just to shake her hand. Her right hand had rows and rows of bracelets that clinked as she took my hand. I had brought with me a rare photo that ABC TV local stations used to focus the camera on when they went to commercial. I nervously watched as she signed it with my ink pen which didn’t take on the glossy photo (this is pre-Flair pen days) and she didn’t have another pen either, so the autograph is sort of scratched into the photo. She surprisingly asked me “Oh, Endora eh? So which was your favorite Darrin Stevens name?” “Durwood” I replied. “Mine too!” she said, “it was so easy and fun for me to say, it was the name we used the most. Is there anything else? I must pack.” I asked if I may take her picture with my little instamatic camera. She regally struck a profile pose. “Now young man, I must go.” She headed back into her dressing room and I wandered unescorted through those wonderful backstage hallways and walkways of theatrical history. Not knowing where I was going, I found myself at the edge of the stage. The lone single ghost light was standing center stage. ‘Why not?’ I thought, this would be my only chance! I peaked out from behind the curtain – no one. I took my first step. My clunky wooden platform shoes echoed on the wooden floorboards as I crossed the stage Judy Garland and all the legends had stood on. When I came to center stage, I stood there for a second and breathed – you can breathe it! I took a silent bow . . . and left. Dagwood, Darwood, Durwood, Durweed, Beady eyes, Charm Boy, Dalton, Dar-Dar, Darius, Darwick, Darwin, David, Dawson, Boy, Delbert, Dennis, Denton, Derek, Derwin, Dexter, Digby, Dino, Dobbin, Dogwood, Donald, Dorian, Dulcin, Dulfin, Dum Dum, Dumbo, Dumpkin, Duncan, Featherhead, Glum-Dum, Tinker Bell, What’s his name and Low-grade mortal.